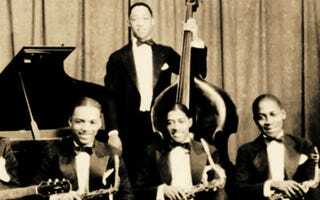 (The Root) — Celebrating the world of swing, The Savoy King: Chick Webb and the Music That Changed America revisits the music's heyday through the life and legacy of Chick Webb, the house-band leader at the legendary Savoy Ballroom in Harlem. Directed by Jeff Kaufmann and featuring narrations by Bill Cosby and Tyne Daly, The Savoy King intertwines historical anecdotes of Webb with as-of-yet-untold stories of the famed drummer and bandleader. The Savoy King has screened at this year's 50th annual New York Film Festival on Sept. 29 and is scheduled to screen again Oct. 2 at 3:30 p.m. A panel discussion at Harlem's Schomburg Center for Research in Black Culture is also set to complement the film's two showings at NYFF, featuring Webb's nieces, actress and playwright Gertrude Jeannette and swing choreographer Norma Miller, as well as Richard Gale, the son of Moe Gale, owner of the Savoy Ballroom. Visit the film's website. For further information on the film and tickets to The Savoy King at this year's NYFF, visit the festival's website.